Polymers are complex materials with flexible forms, widely varied compositions, and properties that change as the polymers interact with their environment over time. Structurally, polymers are large molecules built from many small molecules and can consist of many thousands of atoms in chains or networks of repeating units. Polymer Curing refers to the toughening or hardening of a polymer material through the cross linking of polymer chains. Composites are complex—they are hierarchical designs of matrices, fibers, and other components that are both materials and structures. Polymer Matrix Composites (PMCs) challenge the industry to develop innovative durability models that will enable composite developers and component designers to tailor the properties of the matrix resin and the interstitial phases between matrices and fibers to the intended use environment, just as they tailor the direction of the fibers to the principle direction of loading. As application environments go to extremes of stress, temperature, chemical compositions, and other factors, this challenge becomes both more important and difficult to achieve. Composite materials are used in high performance products which are required to be lightweight, chemically inert yet mechanically strong to cope with harsh conditions in applications like Aerospace, Automotive and Defence. The application of microwave heating to polymers and polymeric composites has been pursued worldwide over the past three decades.Microwave processing offers many advantages over conventional thermal processing. Rapid volumetric heating in microwave processing would significantly reduce cycle times and additionally, since power is applied directly to the material, the need to heat processing equipment is avoided and energy requirements are further reduced. Microwave Curing Ovens are fast making their way into industries and replacing the conventional ovens like electrical ovens and gas/oil fired ovens. Typical applications in Industry include Resin Bonded Abrasives and Composites used in Aerospace industry. 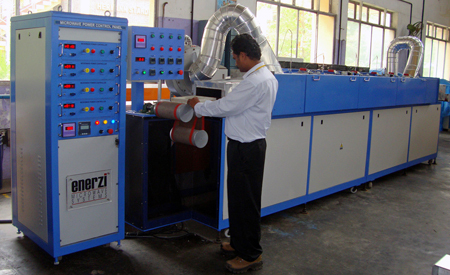 Enerzi offers two important variants of Microwave Polymer Composite Curing Ovens viz. Batch and Conveyor systems.